During the past couple of years or so, there have been numerous additions to the world of Midwest finesse fishing. These additions and changes seem to be a byproduct of more and more anglers across the nation becoming acquainted with our tactics, and some of them are introducing the tools that they prefer to use. Several of these new tools have emanated from the power fishing fraternity. One of those new features and modifications revolves around jigs with bigger hooks than the jigs that the traditional Midwest finesse anglers use. The style of the jig has also changed. Gene Larew Lures has been one of the vanguards of this transition. And recently, they have created a new and unique Midwest finesse jig that they call the Ned Rig Pighead. It is described as being “a flat-faced football head,” which possesses a bigger hook than the hook that adorned the old-fashioned mushroom-style jigs that old-time Midwest finesse anglers have been wedded to for many years. The Pighead is manufactured in three sizes: 1/16, 1/8, and 1/4 ounce. The length of the lead portion of its head is three-eighths of an inch. Its width is an eighth of an inch. In the middle of the head, which is where the eye of the hook emerges, its height is three-sixteenths of an inch. Adjacent to the eye of the hook, the head has a circumference of about three-quarters of an inch. The circumference decreases slightly as it reaches each end of the head, but this decrease is not as significant as the decrease of the circumference of a National Football League football; thus, in the eyes of some anglers, the shape of the Pighead is more pill-like than football shaped. The eye of the hook extends three-sixteenths of an inch above the top of the lead. 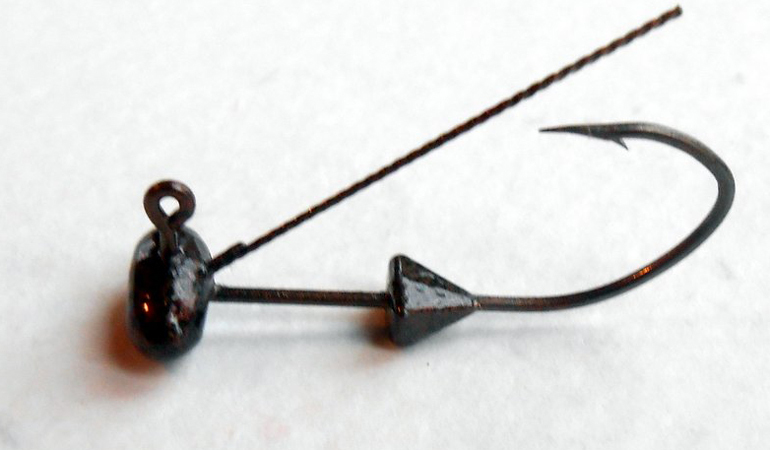 The shank of the hook is adorned with a bait keeper that has the shape of an equilateral triangle. The base of the bait keeper is three-sixteenths of an inch long, and each of the other two sides of the bait keeper is three-sixteenths of an inch long. Its altitude is also three-sixteenths of an inch long. The base of the bait keeper is situated slightly more than three-eighths of an inch from the back of the flat-faced football-shaped head. It is called a HoldTight bait keeper. Radiating from the middle of the lead of the football-shaped head and between the eye of the hook and shank of the hook is a stainless-steel and cable-style hook guard. It is 1 1/8 inches long and extends three-eighths of an inch beyond the point of the hook. Thus it is likely that some anglers will shorten the guard, making it about three-quarters of an inch long. At the top of this photograph is the three-inch Hoodaddy, and at the bottom is the Ned Rig Inch Worm. Both are affixed to a 1/16-ounce Pighead. Stretching back several decades, Gene Larew Lures' soft-plastic baits have adorned the repertoire and tactics of many Midwest finesse anglers. Now, these anglers can affix the 1/16-ounce Pighead to a variety of Gene Larew Lures’ soft-plastic baits, such as the three-inch Larew’s Baby Hoodaddy, 3 1/2-inch Biffle Bug Jr., 3 3/4-inch Ned Rig Inch Worm, four-inch Salty Ring Tail, five-inch Salt Head Shaky Worm, four-inch Salt Craw, six-inch Tattletail Technique Worm, 3 1/2-inch Wheeler Hammer Craw, and 3 1/2-inch Rock Banger. Some of these baits will be slightly customized by removing portions their anterior sections; for instance, an inch or more will be removed from the Tattletail Technique Worm, and an inch might be removed from the Salt Head Shaky Worm, and a half of an inch or slightly more from the Salt Craw. At the top of this photograph is the Biffle Bug Jr., and at the bottom is the Tattletail Technique Worm. Both are affixed to a 1/16-ounce Pighead. It is manufactured in a hue that is called Copperhead. A package of four 1/16-ounce Pigheads costs $5.99. A package of four 1/8- and 1/14-ounce Pigheads also costs $5.99. (1) Here is a link to the Gene Larew Lures website: //www.genelarew.com/pighead.